Tag - you're it! . . .
Tag – you’re it! . . . The heading above might seem strange, coming as it is from the premierengraved-metaltag supplier in the U.S., but it is quite appropriate. Though Newline Trophy is known for our high-qualitycorporate awards,crystal trophies,acrylic trophiesand exceptionalengraved plaques, we are also well-respectedengravers, specializing inengraved metal tags and platesfor customers across the country. We handle multiple orders daily for custom-engraved metal plates created out of solid brass, aluminum or stainless steel. Our knowledge and capabilities are second to none, with the highest-quality substrates, equipment and staff in our industry. 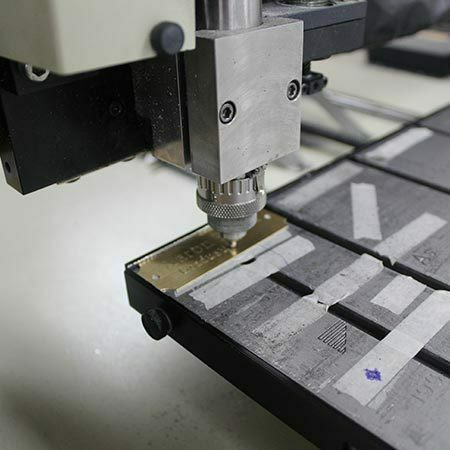 Hopefully, this article will persuade you to give us a shot at your next engraving project. 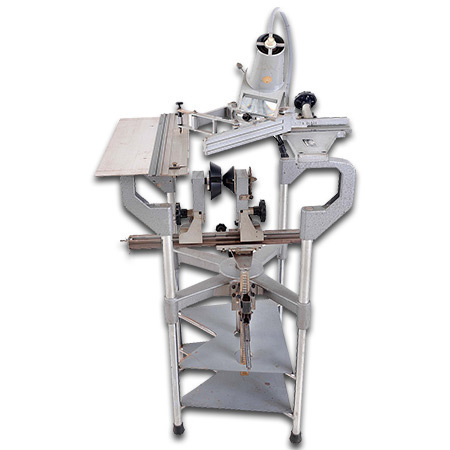 Since 1982, when we used a pantograph engraver (see image below) to hand-set type and scaling fonts for engraved gifts, we discovered the beauty and value of industrial-diamond engraving. 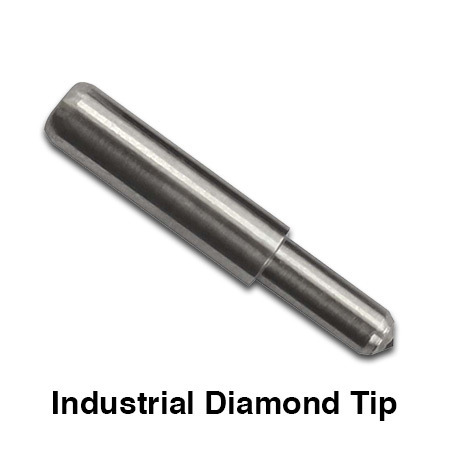 The photo below shows an industrial-diamond engraving tip. Notice the sharp point, which drags across the surface, permanently marking it. This type of engraving creates a fine line in the metal, creating a matchless look. Often, we oxidize the engraving on brass in order to create black lettering, adding contrast to the text and substrate. Below, we apply the oxidizing solution. This image shows a completed diamond-engraved plate. Often, we add logos and special icons to metal, and though we can produce logos through industrial-diamond engraving, we usually choose a laser engraver. The lasers quickly and accurately reproduce graphic images on coated metals like black aluminum or brass. 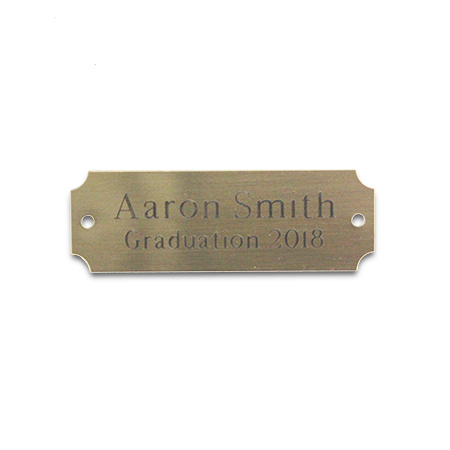 Virtually any image, from photographs to company logos, as well as engraved text, can be laser-engraved on to coated metals designed specifically for that purpose. These images show the design, and a laser engraver marking a black anodized aluminum plate. 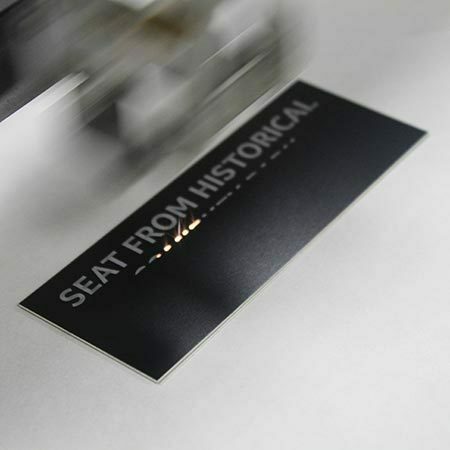 Nothing marks metal as quickly and accurately as a high-powered laser engraver. 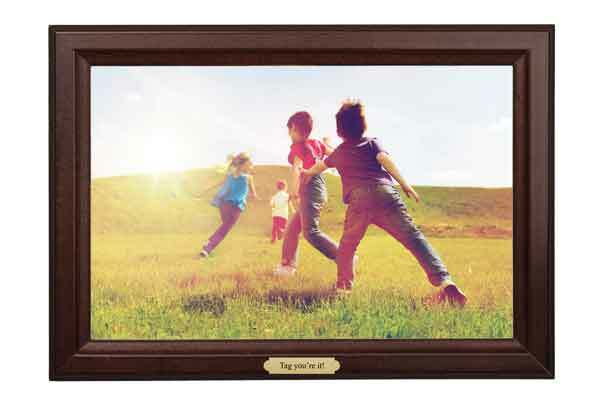 Newline Trophy offers laser-engraved metal plates in black brass, black aluminum, blue aluminum, red aluminum, anodized black aluminum, exterior black aluminum, blue marble brass, red marble brass and green marble brass, all of which can be created using multiple-edge profiles, and mounting options as shown below. 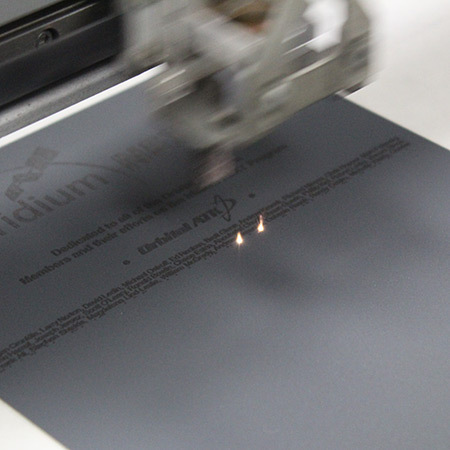 This image shows the completed laser-engraved plate being produced in the images above. 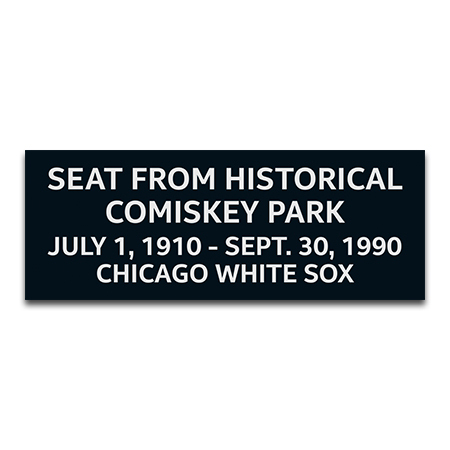 One of our popular laser-engraved substrates is stainless steel, using 22-gauge, #304 brushed stainless steel, chosen for its corrosion resistance. These plates create a durable, long-lasting product. 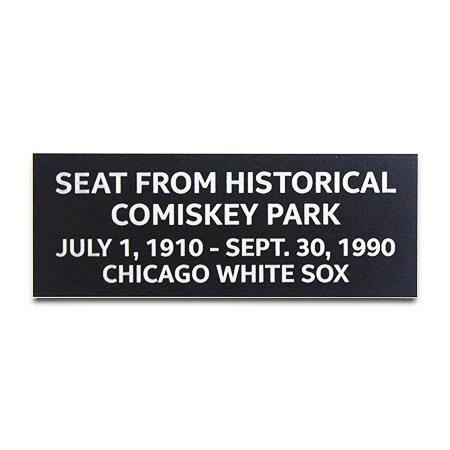 We use a molybdenum compound, applied to the surface prior to laser engraving, which draws the carbon in the steel to the surface, leaving a beautiful, permanent, dark black image. Shown below is a virtual proof, and one of our laser engravers working its magic on a stainless steel plate (note the molybdenum compound on the surface) we created, that actually is in one of the Orbital ATKsatellites circling the earth. 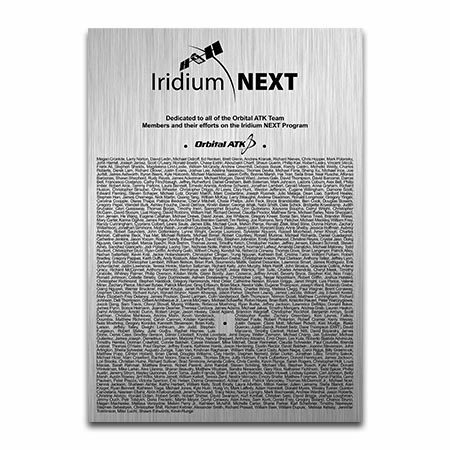 This plate was adorned with the names of the individuals who contributed to the Iridium NEXT Program. We can finish our stainless steel plates with any of the edge profiles shown below, or provide double-sided adhesive for easy mounting. This image is of the completed product prior to delivery and installation on the satellite. 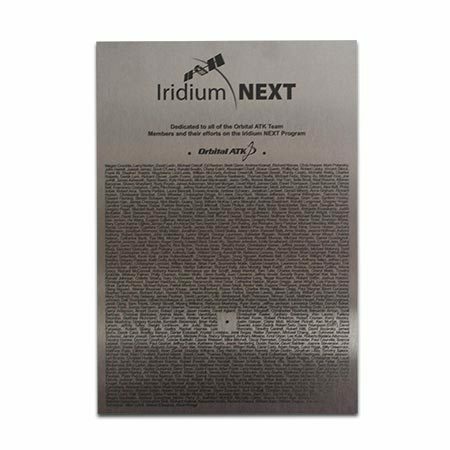 Though Newline Trophyhas a broad depth of knowledge for engraving metal, we also print metal plates and engrave plastic substrates. We use these processes nearly every day to engrave and decorate fine acrylic awards, crystal awards, corporate plaques, and trophies. We hope you enjoyed this post, and we look forward to an opportunity to serve you through our extensive capabilities.